The Musings of a NSW modeler...: Tiny Victorian! Body: Firstly i calculated a few dimension to get the right length for the B class and then out came the razor saw. Each half (nose end) was cut from the rest of the bodies. On each exposed end (ends to be joined together) the panels were cut back to the next rivet join as i would be placing a new styrene panel in place with the new engine room access door scribed in it. All roof gear (moulded horns, dyno and radiator fans) was filed down and cut out. 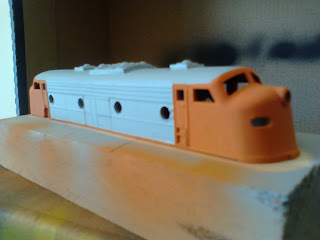 At this time the holes in the roof were filled with styrene where appropriate then body filler was used and once dry sanded flat. There are a few anomalies that i left unchanged ie: the 2 end engine room windows closest to the cabs are left in their original positions and the 2 inboard windows were simply drilled out so that all windows are equidistant. From the discarded body ends the cooling fans were cut and fashioned to best resemble the equipment on the B class which has slightly risen fans based on flat panels that are "cut in" to the roof line. At this time the secondary headlight which is found halfway down the front nose was filled in at both ends as the B class only has the 1 headlight bezel, and the cutting out of the staff exchangers which was then backed by a piece of styrene to give depth but also allow the fitting of the hook and steps. The now joined body was striped of its remaining paint (1/2 Baltimore & Ohio, 1/2 Union Pacific), any cracks or imperfections filled, sanded and primed. 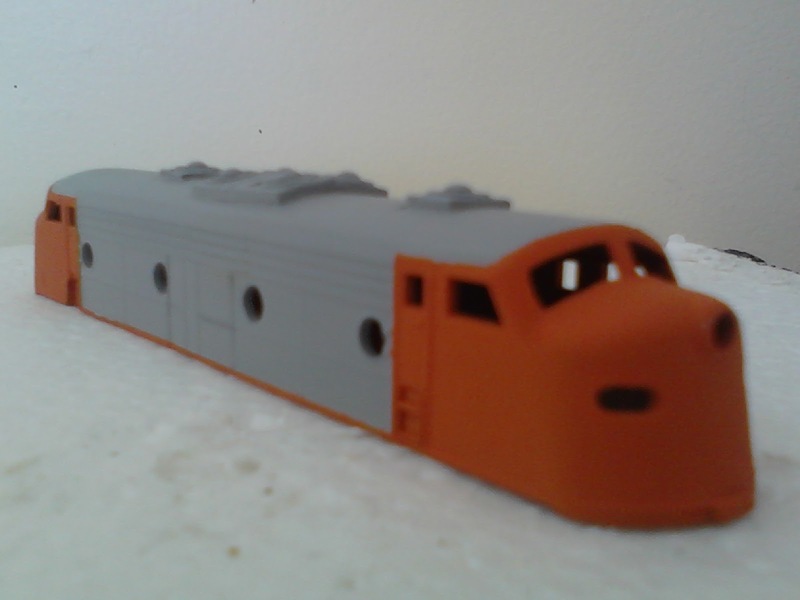 I have chosen to go with the Grey/Orange Vline livery. For the Grey i have left it the colour of the airbrushed Grey primer used. 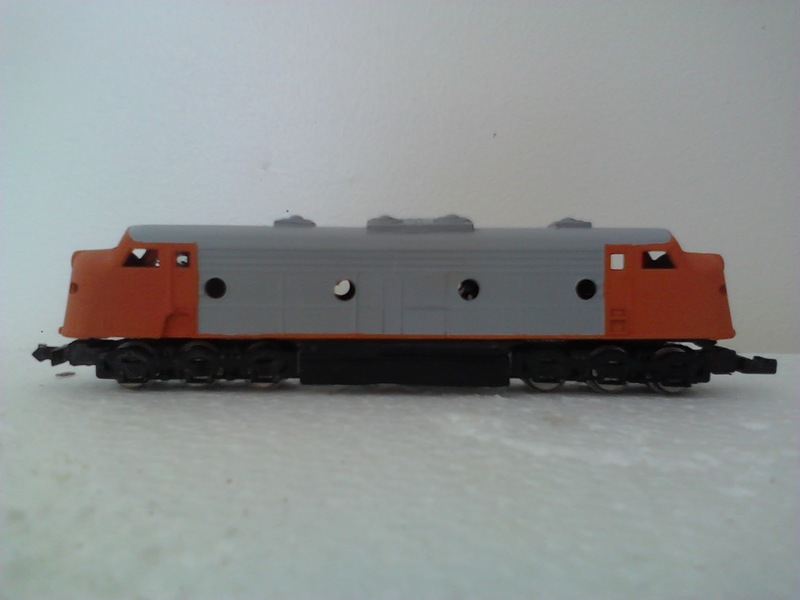 This is a bit light but i will be weathering this loco so it gives a good base for that faded effect. The orange is airbrushed Humbrol Flat orange again lighter that the prototype. Being the first N scale model i have done any kind of work on i am pretty pleased with the almost seamless finish that has been achieved. 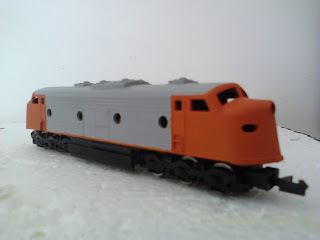 I have placed an order for decals, then it will be detail components such as handrails, horns, steps and some scratch built pilots including brake pipes etc, drill out marker light bezels and the fitting of some N scale Kadee's. The next part of this conversion is to shorten one of the E8 chassis (not the one the body is sitting on) which is a cast alloy wire in some lights including some optic fibre marker lights and weather the whole lot up..